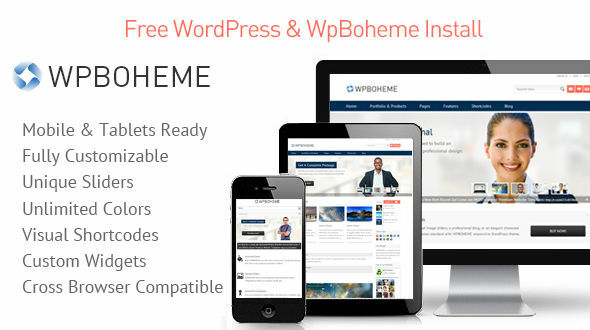 WPBoheme is a professional & fully responsive WordPress theme, with unlimited design options and unique features. 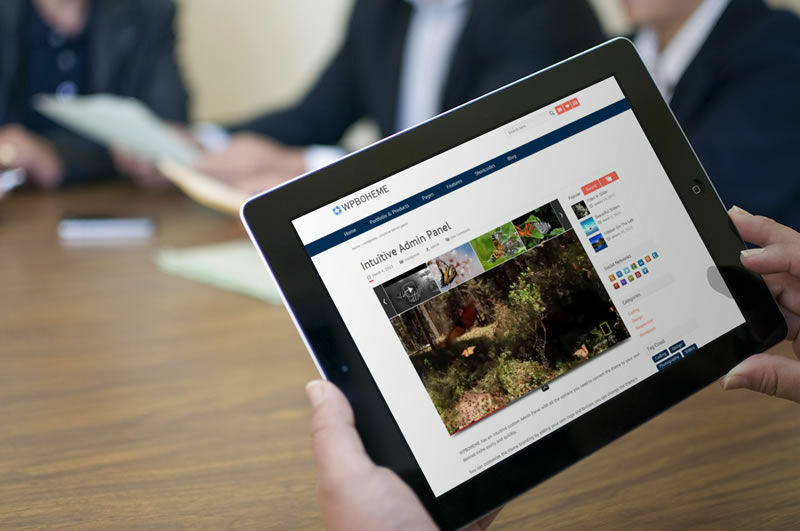 The user friendly admin side is intuitive and easy to use. Anyone can edit the theme without hassle. Moreover, we have an ongoing support team available to answer all your questions. 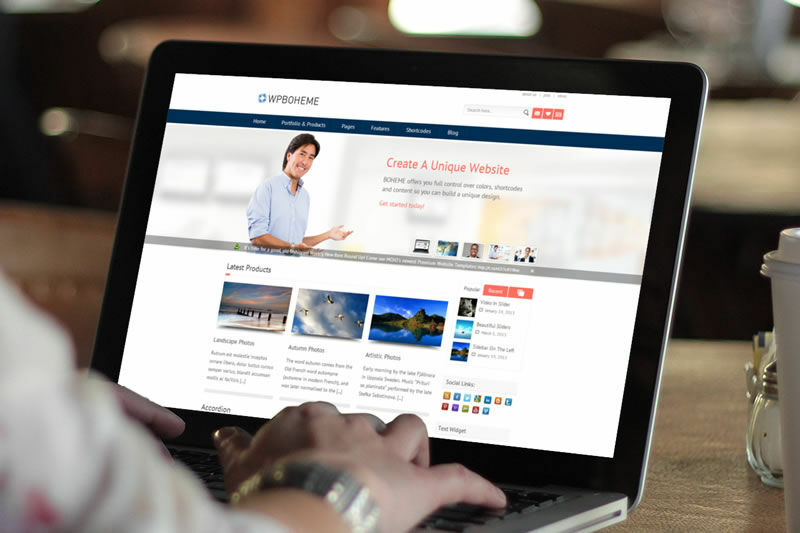 Built with HTML5,CSS3 and jQuery, WPBoheme is cross browser compatible. It works smoothly on FireFox, Chrome, IE9, IE10, Safari, Opera, and on any Smartphone, tablet or desktop computer. Some of the most interesting options are detailed next, followed by a complete feature list. 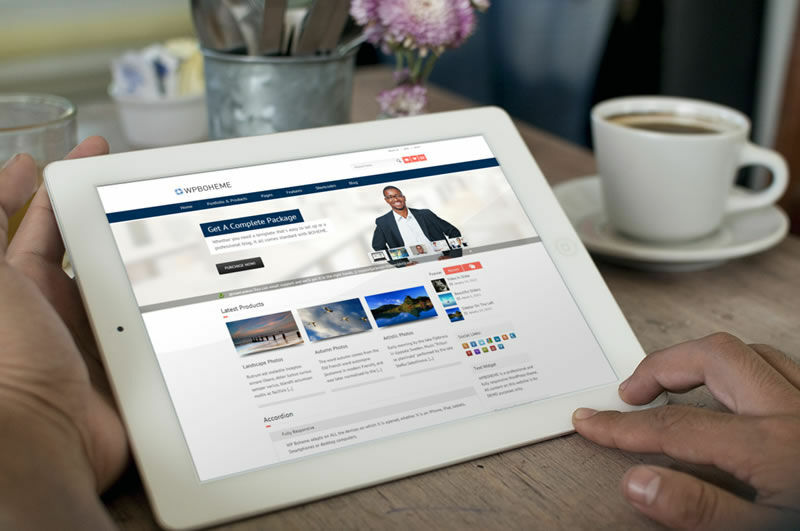 Fully Responsive Design – WPBoheme adapts on all the devices on which it is opened: iPhones, iPads, tablets, Smartphones or desktop computers. 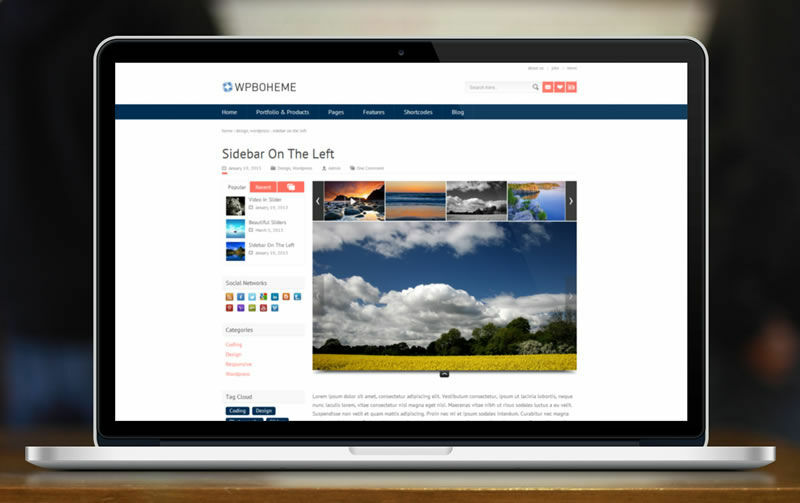 Featured Image In Menu – WPBoheme allows you to add a featured image and text for each main menu item. Intuitive Admin Panel – WPBoheme has an intuitive custom Admin Panel and includes all the options you need to customize the theme easily: add your own logo & favicon, change the theme’s background and colors, modify the text font, create unlimited sidebars and many other useful controls. Tweet bar that can be turned on/off from Admin Theme options. Custom design & behaviour – for the post, product and portfolio top page slider. In these unique sliders you can emebed Vimeo or YouTube videos. Revolution Slider -WPBoheme includes the license for the Revolution Slider WordPress plugin which has its own menu in the Admin Panel. We also developed custom actions & design for this slider’s thumbnails. Unique Related Post Slider -a custom version of the Elastslide Slider. When you place the mouse over the picture thumb a container opens to reveal the post title & excerpt. Custom Post & Page Templates – In WPBoheme you can create custom posts for products, projects, news, jobs and FAQ, each with its own custom fields. SEO optimized – WPBoheme code structure is clean and organized, allowing search engines to index your website pages correctly. Built with HTML5, CSS3 and jQuery. Cross Browser compatible, tested on FireFox, Chrome, Safari, Opera, IE9, IE10. Demo Content included in the default set-up for out-of-the-box installation. Extensive manual with detailed instructions. Revolution Slider plugin – $15 Value, with custom thumbnails design. FlexSlider plugin integrated in the slider shortcode that you create with your own images and videos. 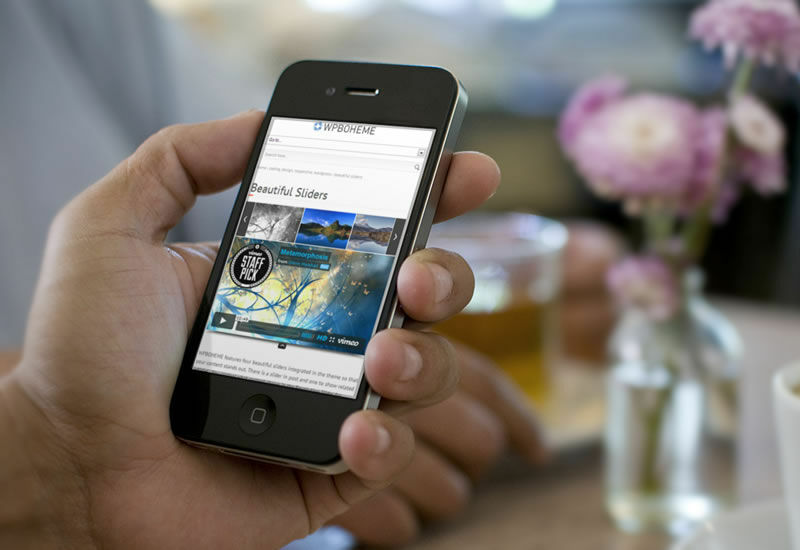 Swipe touch compatibility for Smartphones and tablets with Revolution Slider and FlexSlider. Featured Image In Main Menu – You can upload one image and text for each first level menu item. Extra Side Navigation Menu with mouse-over effect. Beautiful jQuery effect at mouse-over for products/portfolio thumbnails. Boxed or Wide layout version supported (editable from the Admin Panel). Unlimited colors to modify the theme’s design supported by a Color Picker tool. Logo and favicon can be changed from the Admin Panel. Google Analytics field available in the Admin Panel. All you have to do is copy/paste the code from your Google account. Pre Footer Area, with open/close system. You can enable/disable this menu from admin. Add here text or images (html supported). Widget Footer with on/off control from admin. 3rd Menu & Copyright Footer Area with on/off control from admin. On/Off control for the following content: comments, author box, post meta, breadcrumbs, share social, related posts. Custom 404 Not Found page included.